Flow cytometric analysis of live human peripheral blood mononuclear cells using HLA-DR (L243) Mouse mAb (APC-Cy7® Conjugate) (solid line) compared to concentration-matched Mouse Isotype Control (APC-Cy7® Conjugate) (dashed line). 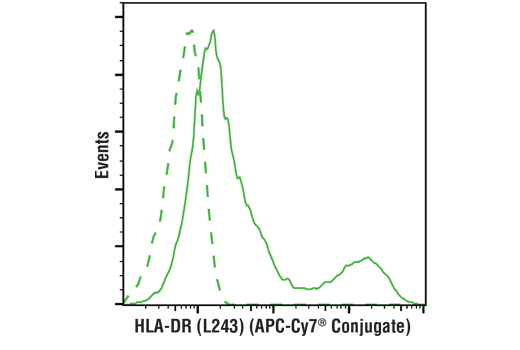 HLA-DR (L243) Mouse mAb (APC-Cy7® Conjugate) recognizes endogenous levels of total HLA-DR proteins. This antibody is specific to an epitope on the alpha subunit of the heterodimeric HLA-DR protein and binds a different epitope than the LN3 antibody clone. It does not cross-react with HLA-DP or HLA-DQ. This Cell Signaling Technology antibody is conjugated to APC-Cy7® and tested in-house for direct flow cytometric analysis in human cells. The L243 antibody reacts with a member of the human MHC Class II antigens, HLA-DR. The HLA-DR antigen is expressed on B lymphocytes, activated T lymphocytes, activated NK cells, monocytes, macrophages, other antigen presenting cells and progenitor cells (3).